Live in Maplewood Village – Apartment living at its finest! 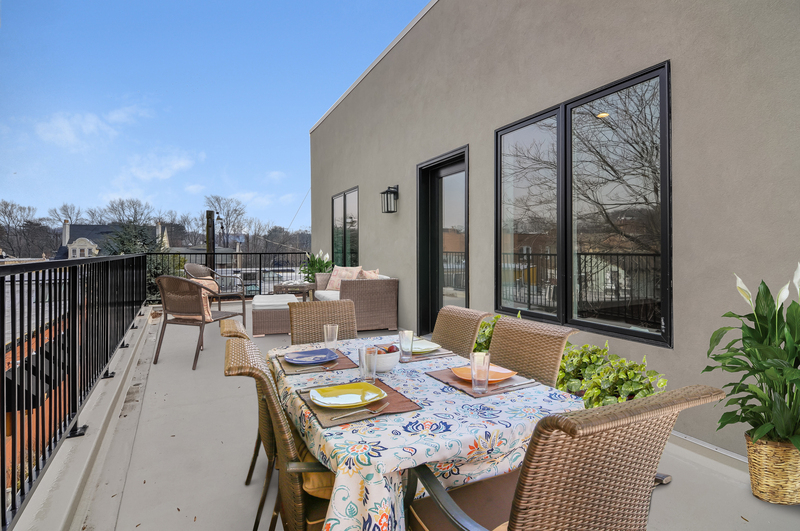 Only one of these stunning Maplewood apartments is still available for rent – Unit C. This is a huge unit with 1580 square feet of open floor plan and 9 foot ceilings. The unit features two bedrooms and two full bathrooms, its own 336 square foot patio, an in-unit laundry room, a private storage closet and free off-street parking. Large thermal Pella windows ensure abundant natural light. Privacy barn doors separate the main living space from the bedrooms. The master bedroom has a walk in closet, ensuite bath with double sinks and a linen closet. The spacious second bedroom also has a walk in closet. Stainless steel Samsung appliances in the kitchen and solid surface counter tops in the kitchen and baths are some of the on trend finishes used in this beautiful unit. The full size Electrolux washer and dryer with a steam feature, storage cabinets and a utility sink in the laundry room makes for effortless laundry days. Each unit in the building has its own video intercom entry system to see and talk to visitors. And, the building is pet friendly! For additional property information and photos, please go to 97BakerSt.com. For a video tour, please go to https://vimeo.com/253691787.